This was my thought process as I journeyed through this piece. Art always seems to help make sense of life, for me. Happy Weekend to all! Perfectly abstract Laura. 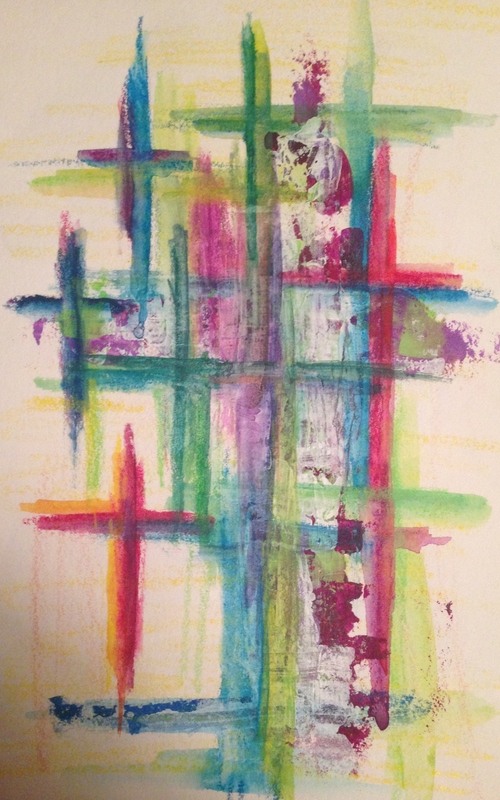 I’ve always wanted to paint abstract, but if I tried, it would be with “blind faith”I’m afraid. My problem with painting abstract, I think it out too much. I probably need to be blindfolded. But knowing me, I’d pull the corner of the blindfold down too peek at my work. I can remember a drawing class where we had to only look at the subject, not to look down at our drawing at anytime. Ooh, now drawing without looking at the paper…..I usually don’t even try that. I never liked that in school. Abstract, to me, is a feeling and a couple of colors. I start with that and just see where it goes. It’s kinda like driving without a map. I must give abstract a try. Oh, I really hope you do! Truly frame-worthy, Laura! And I love that art makes sense of life for you! ❤ Thank you for sharing beauty and joy with us! Wow. Wow. Wow! And may I mention: Wow. LOL Best.comment.ever! Thank you, Kirk! I’m so glad you connected with this one! Love this “word” from the Kirkster. Love the color, shapes, movement…the opposite from your faces but equally beautiful! Thank you, Johanna! I really appreciate it. 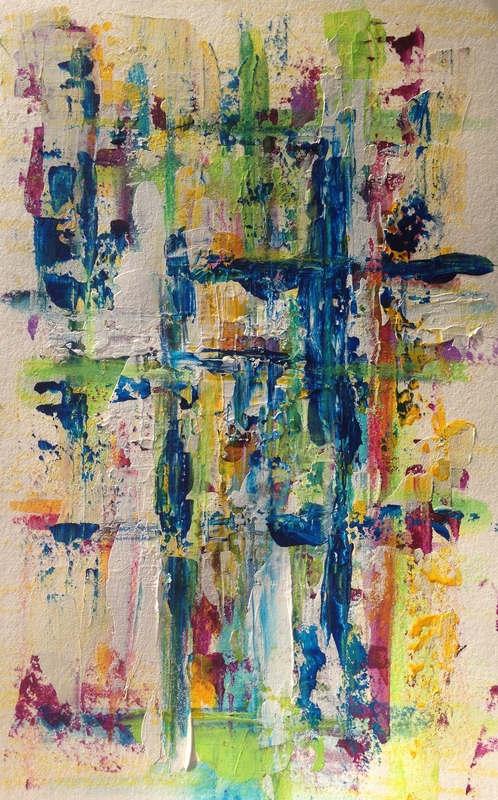 I need to do many more abstract (and many more acrylics) before I am feeling comfortable, but I really do enjoy them. Glad you did, too! Thanks, Donna! I appreciate it. Glad you enjoyed! It really is; thank you. Thanks, Kathy; we can use them! Thank you. Thank you, Ann! I hope you’re having a great weekend too! I’m all for color and texture! Beautiful piece Laura, what better way to work out the angst of everyday life but through art. Have a peaceful day! Love! You should scan, print and frame it! Aww, thank you! Mayhaps I shall! Thanks, Suz. I should call this one “Therapeutic” lol. Boy, and it’s not always easy. Thanks, I’m glad this spoke to you. I love the textures and colors and that you are playing around with old pieces that didn’t quite do it for you, and you’re making them fabulous! Thanks! I’m all about texture and color these days. So glad you like!